Race & Justice News: Risk Assessment or Race Assessment? Pennsylvania drug-free school zone enhancements declared unconstitutional, 95% of elected prosecutors nationwide are white, and more in our latest Race & Justice News. Risk assessment or race assessment? A recent issue of the Federal Sentencing Reporter examines risk assessment practices in sentencing as well as the administration of other criminal justice policies, such as diversion programs and discretionary parole decisions. Guest editor Sonja Starr argues that sentencing based on behavioral generalizations related to socioeconomic status and gender is unconstitutional for the same reasons that the Supreme Court declared gender-based “statistical discrimination” to be unconstitutional. She adds that sentencing based on other group-based factors, such as criminal history and demographic characteristics, is constitutionally permissible but morally troubling. In his article for the issue, Bernard Harcourt argues that prior criminal history “has become a proxy for race” in the era of mass incarceration. Pennsylvania’s enhanced penalties for drug distribution near schools have been declared unconstitutional by the state’s Supreme Court, reports the Morning Call. This follows a U.S. Supreme Court ruling that any fact presented as an element of the offense, which automatically triggers a mandatory minimum, must be proven to a jury beyond a reasonable doubt. The Pennsylvania Court found that the state’s method, which allowed judges to make many of these types of findings with a lower burden of proof, ran contrary to the U.S. Supreme Court decision, and was therefore invalid. Drug-free school zone laws disproportionately impact urban areas with high-density populations, whose residents are overwhelmingly people of color and economically disadvantaged. The Pennsylvania ruling restores judges’ discretion in their sentencing, as they are no longer required to apply mandatory minimum sentences in most such situations. The decision extends beyond school zone cases, invalidating many other mandatory minimum sentences as well. Defense attorneys lauded the court decision, which came as calls to repeal mandatory minimums had gained limited traction in the state legislature. A new study analyzing the race and gender of elected prosecutors nationwide found that the vast majority of prosecutors are white men. Out of 2,437 elected prosecutors, 95% are white and 83% are men. “White men make up 31% of the population, yet they control 79% of elected prosecutor positions,” write investigators at the Women Donors Network. Only 1% of elected prosecutors are women of color and 60% of states have no elected black prosecutors. Nicholas Fandos of The New York Times explains that diversity of prosecutors has received little scrutiny, even though many experts believe prosecutors wield more influence over the legal system than police officers. Prosecutors decide whether to bring criminal charges and what levels of charges and sentences to pursue. This prosecutorial power goes virtually unchecked, with 85% of elected prosecutors running unopposed. “What this shows us is that, in the context of a growing crisis that we all recognize in criminal justice in this country, we have a system where incredible power and discretion is concentrated in the hands of one demographic group,” said Brenda Choresi Carter of the Women Donors Network. 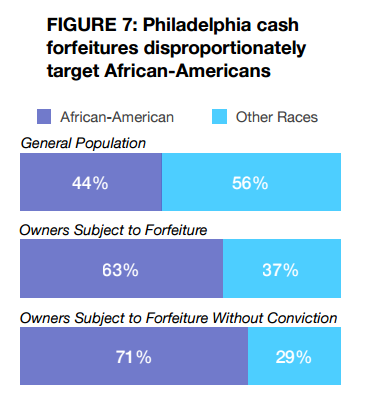 Although forfeiture laws were initially created with the aim of financially dismantling major criminal networks, in Philadelphia and elsewhere, police increasingly target people carrying small amounts of cash. Sixty percent of the seizures made by Philadelphia law enforcement agencies were of cash totaling less than $250. Many people never see their money returned due to the high burden of proof and prohibitive time and financial costs of challenging forfeiture in court. Prosecutors and police officers have incentives to seize cash and property, as revenues from asset forfeiture is applied to their budgets and bonuses. Scott Kelly, author of the ACLU report, notes that the Philadelphia District Attorney’s office made “roughly $2.2 million – or 7.3% of its appropriated budget” from asset forfeitures. Pennsylvania legislators are considering legislation that would require a conviction before cash and other property seizures are finalized. Drawing on discussions from the Harvard Kennedy School and the National Institute of Justice’s second Executive Session on Policing and Public Safety, David Bayley, Michael Davis, and Ron Davis developed an agenda to alleviate problems of race in policing. “Race and Policing: An Agenda for Action” is divided into two parts: “Strategic Voice” and “Tactical Agency.” In Strategic Voice, the authors argues that police leaders should use their voice to call public attention to the structural causes of crime and disorder, such as underfinanced public services, housing segregation, and unemployment, which lead crime and disorder to be concentrated in communities where African Americans, Latinos, and new immigrants live. Police should also use their voice to criticize racially biased criminal justice policies and develop strategies to obtain public consent, such as supporting civilian review.